St John Ambulance NT were excited to welcome Santa to Darwin at the start of the silly season, to spread some festive cheer for those most in need before the big day! Joining forces with other local Emergency Services and Defence, a St John NT Volunteer Unit and Ambulance took part in ‘Taskforce Santa’ – an initiative which collects unwrapped donations of food, toys, clothes and cash for Territorians who could use a little extra help at Christmas time. The crew started their drive at Rosebery and made their way in a convoy to the sounds of sirens and horns through Palmerston and Darwin - ending their journey at the Botanical Gardens for some wonderfully festive Carols by Candlelight. St John Ambulance was proud to partner with Mix104.9 and all our colleagues who work in the defence and first response space in this event. We are looking forward to stuffing the bus with even more Chrissy treats next year! Everywhere in the world, volunteers provide assistance to both individuals and whole communities in desperate need of help. On 5th December 2017 the world celebrated International Volunteer Day – 24 hours dedicated to acknowledging the great work and stunning achievements of volunteers around the globe. To mark this day and thank our St John Ambulance NT volunteers for everything they do, a special ceremony was held at Alice Springs Town Council hosted by Volunteering NT and the Deputy Mayor Jamie de Brenni. Thank you to everyone for a wonderful event and for the ongoing dedication and commitment of the St John Ambulance NT volunteers which is so vital to our organization. St John Ambulance NT were pleased to join Natasha Fyles, Minister for Health at the Royal Darwin Hospital on 29 December, to deliver a very special message. After the Christmas frenzy had died down and thoughts turned to New Year’s Eve celebrations, the pair, on behalf of all emergency services in the Territory, wished everyone a very happy 2018, but also, to please - “Party Safe”. “Party Safe” means, have a great time but also make smart choices. You can do this by looking out for your friends, being kind to each other and travelling responsibly on the roads. Though there were additional ambulance services in place to accommodate the busy NYE weekend, James Gardiner, Regional Manager at St John Ambulance NT stressed that ending your celebrations in the back of one of the St John ambulances is not how your night should finish. On behalf of all the emergency services across the Territory, St John Ambulance NT hopes you had a fantastic time celebrating NYE and wishes you a bright and fun-filled 2018. Our community Education team travels all across the Northern Territory delivering FREE first aid training to school students, and it’s now even easier to get in touch with them via a new dedicated Facebook page. St John Ambulance NT is committed to promoting the importance of first aid in the community and we believe that there is no better place to start than in our schools. Every child in the Territory should have access to vital first aid knowledge and with the First Aid in Schools program this is possible. 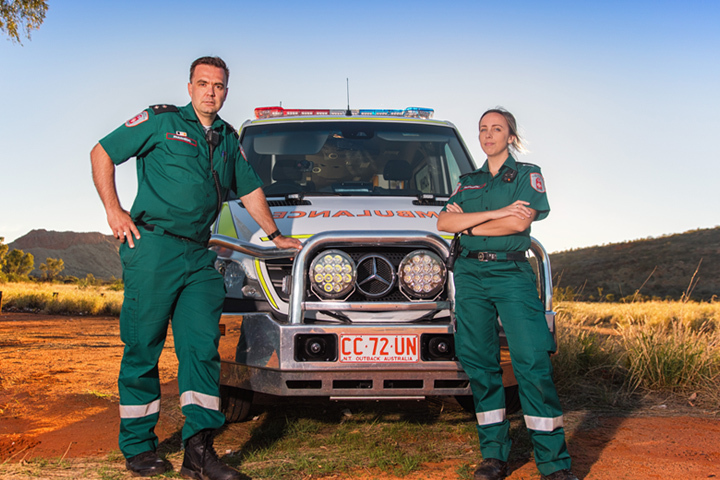 You can now follow the team as they visit schools across the Territory teaching vital life-saving skills to young people, as well as discover news, updates and general information on the program. The new Facebook page will also make it easier than ever to get in touch with the team to book a First Aid in Schools visit for your child or class in 2018. Mental Health and Wellbeing Co-ordinator Mandy Paradise and Community Education’s Jo Bigwood at St John Ambulance NT are giving up not just their time, but also their hair for a good cause in 2018. Blood cancer claims more lives than breast cancer or melanoma. Today, another 35 people will be given the devastating news they have leukaemia, lymphoma, myeloma or another blood disorder. To raise funds for the Leukaemia Foundation and help Aussie families facing blood cancer get the emotional and practical support they need, Mandy and Jo will be embarking on the World’s Greatest Shave this year. You can shave your hair, cut it short or colour it, it doesn’t matter which, it all helps ensure someone being treated in hospital gets a personal visit from a highly-trained health professional.